A few days back, Motorola launched its flagship smartphone, the Moto Z2 Force in the US that misses out on the 3.5mm headphone jack. For those who love the Moto Z2 Force but feel that the lack of the 3.5mm jack is a deal breaker, there is an interesting (but aggravating) rumor that was posted yesterday on Twitter by Andri Yatim, the Moto Z2 Force ‘International’ version may come with a 3.5mm headphone jack that is not included in the US model. The leakster further reveals the international version of the smartphone will feature 6GB of RAM and 128GB of inbuilt storage capacity. The upside for the U.S. unit, if this rumor is legit, is that it will be thinner than the overseas model. But we have to wonder how many stateside Moto Z2 Force buyers would rather have the headphone jack back and wield a phone that might be a few measly mm thicker. However, we’ve been told by the manufacturer that there’s nothing to these rumors, and that all Z2 Forces have the same USB-C port only for audio. The Moto Z Force and the Moto Z, both ditched the 3.5mm headphone jack last year. Three things set the Z2 Force apart from other high-end Android handsets: the screen, the camera, and MotoMods. This device’s main selling point is that it’s got a display that won’t shatter or crack from everyday falls. Motorola calls this technology ShatterShield. The Moto Z2 Force’s highlight is its signature ShatterShield display. Like lasst year Z2 Force sports a 5.5-inch QuadHD AMOLED display and is powered by Qualcomm Snapdragon 835 processor, paired with 4GB of RAM and 64GB of internal storage. The second variant comes with 6GB of RAM and 128GB of internal storage. There is an expansion slot for microSD cards of up to 256GB as well. The smartphone runs Android 7.1.1 Nougat out-of-the-box with a promised upgrade to Android O to come. The two 12MP f/2.0 cameras sensors (one RGB and one monochrome) of Moto Z2 Force are complemented by laser and phase detection autofocus, two-tone dual-LED flash, and optical image stabilization. At the front is a 5MP selfie shooter, with a two-tone dual-LED flash. Including two cameras has also allowed Motorola to add depth-of-field effects like blurring the background behind your subject — similar to Apple’s Portrait mode. There’s a “True B&W” mode too, which uses just the monochrome sensor to capture a “true” black-and-white image instead of simulating the look with software. 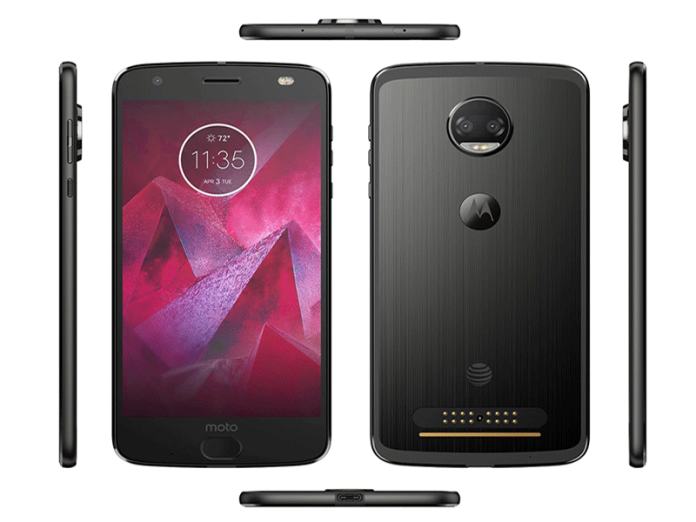 The Moto Z2 Force is much thinner than last year’s phone Moto Z Force, but that sleek design comes with a significant sacrifice in battery capacity; the Z2 Force has a 2,730mAh battery compared to the 3,500mAh battery in the old Moto Z Force.